Ask the students of any established higher educational institution in the world and they'll all be able to point to you some of the must eats of the neighborhood around the campus. In my alma mater's case, a breakfast burrito joint facing the beach, a frozen yogurt stand that was a popular meet up spot, and a high end restaurant serving up some tasty fish tacos every Tuesday comes to mind. 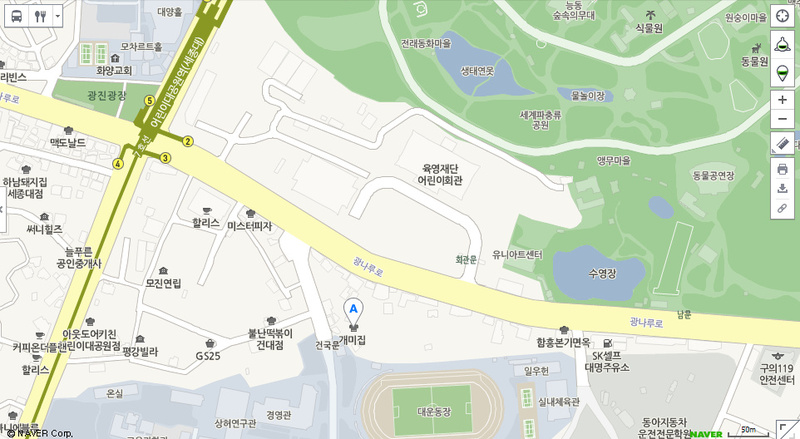 In the case of Konkuk University and its surrounding region, today's post introduces one such legendary spot simply called Gaemi Jib (or "Ant House") that serves a hearty meat and seafood bokkeum (stir fry) that meets the criteria for most top joints frequented by students: (good) taste, (low) price, and (big) portions. Like all good food this is a place that evokes memories; ask any current or former student who were from here and they'll all be able to share an anecdote about the time their seniors bought them a meal here as freshmen with copious amounts of soju to bond, or groups coming here after a study session, or even on a date with their first love. If walls could talk, Gaemi Jib could share with you decades of episodes that have occurred here. Roaring laughter from student groups sharing drinks, bashful confessions of love, tears from a bitter breakup amidst the comforting words of friends. But while the walls can't talk, the family running the three branches of Gaemi Jib could, but won't, divulge the history of the thousands of students that have and still come here. Clustered around the neighborhood in the rear of the Konkuk University campus, this area is definitely more of the "local" one compared to the traffic-busy, lively, and commercialized zone around the campus' front, near the Konkuk University subway station. Interestingly enough, the three Gaemi Jibs (yes, there are three) are all clustered around the same street. All three show their age and all three are run by members of the same family for nearly 30 years now. While they all serve the same menu, each regular patron will tell you that Gaemi Jib #__ is the best one, claiming the taste or service is somehow better at #__ and/or because they have a personal connection with the owners at that particular one. Their signature dish is their bulnak which is a spicy stir fry of pork bulgogi, nakji, and other vegetables in a savory, spicy sauce. The small goes for 21 K, medium for 29K, and large for 39K. You can get a simple nakji bokkeum for lunch for just 5K at lunchtime only. They also have dak doritang at 21K and dweji jjigae for 20K. The serving sizes are a bit misleading for their bulnak because all three sizes are absolutely enormous. I think it's easier to think of their small size as a medium, medium as large, and large as an extra large. I recall going there once with four and thinking a large would suffice and actually being discouraged by the owner to go with the medium as she said a large would be too big for us- and we were four guys! (PS She was absolutely spot on). If you're uncertain, might as well ask what size they recommend. Just be sure to leave room to stir fry the rice in at the end. Or, you can get a smaller portion of the bulnak to also try the dweji jjigae which I recommend (more on that later). As a no-frills, student-catered, drinking/eating spot, sides are very basic at some kimchi and chopped cucumbers with some chogochujang (for the cucumbers) for dipping and eating . Whatever size you order, the bulnak comes in a big ol'pan similar to below. The bulgogi portion is mostly precooked but the veggies and nakji needs a bit of cooking so just wait as everything comes together on the table burners in a delicious, bubbling concoction. One of the interesting things that I mentioned about Gaemi Jib, or I should say Gaemi Jibs, is that there are three of them in the same vicinity. Though they are all by the same family, people tend to have their favorites as they say each one differs slightly in taste or ambiance. (IMO: A slight variable in taste is certainly possible but ambiance... certainly not). The same bulnak below from another branch different than the one above. Perhaps a bit redder in color? Still, no matter which one, I've yet to have a bad experience. They'll tell you you can start eating the rice cakes first. Little thumb-sized guys, these are flour-based rice cakes so they soak up the sauce better than their rice-based cousins and come with a good chew. The sauce itself is quite unique. Most Korean places that serve similar red sauce stir fries- be it chicken, pork, or nakji- tend to give it a sweeter edge which, admittedly, has an addictive quality to it but is often just sugar bombs. The sauce here is definitely more savory than sweet but there are layers to it that comes from more than just peppers. The wild perilla seeds, for example, gives it a nutty edge and despite its red color, it's fairly tame on the spice level though certainly no less flavorful. There's plenty of vegetables like cabbage, carrots, green onion, and zucchini to give it a boost and a hefty portion of bite sized bits of pork and nakji. And when it comes together with their unique sauce, this is one of those dishes that just calls for soju. The dish itself is flavorful but not overly savory that rice is required. This is great news because you should opt for the fried rice at the end. The rice is cooked on the same pan for you by the server with just a bit of seaweed strips, sesame oil, and other goodies. So good. Until my last visit, I only ever had the bulnak but a friend of mine, who as a former KU alum has known this place much longer than I have, recommended the dweji jjigae to me. Since it translates literally into "pork stew" I was thinking this was more a kimchi jjigae type dish. And it even looks like kimchi jjigae when the bit ol' stew is brought to your table. Atop the red stew there's a bit of dangmyeon noodles, chopped green onion, a dollop of minced garlic, and a healthy sprinkling of red chili flakes. After a few minutes of boiling and mixing, it's good for eating. With vegetables, pork, rice cakes, etc, this is essentially the bulnak in stew form minus the nakji. But even without the nakji component, this is a hearty, soul-filling goodness. Though it looks like kimchi jjigae, there's none of that pungent aspect as there is no kimchi in it. But instead that trademark flavor from Gaemi Jib that I can't quite put a full description on it shows. There's plenty of kick from the ample garlic and chili flakes that makes it so Korean in taste but not a taste that's common. I have yet to have had a similar tasting stew elsewhere. And when you leave, you're bound to have a warm and filled stomach while the damage to your wallet isn't so bad because of the reasonable prices after splitting costs with your group. And if you're on a high from those downed bottles, this is especially good news for you to continue on to the next round and make it an eventful night. Hearty, flavorful, massive in portion, this students' favorite hole-in-the-wall hangout has enough merit to appeal to all. Without relying on overly sweet or spicy flavors and instead drawing up its own unique taste, this is a real hidden gem that's worth checking out if you're in the area. Walk out of exit 3 of Childrens' Amusement Park Station and walk straight for about 150m until you get to the big Gwangnaru-ro 24-gil offshoot. Cross to the other side and head down the road for about 100 meters until a small alley. There should be signs at the entrance of the alley for Gaemi Jib. Gaemi Jib 1 is the most popular one for bulnak, but they only offer bulnak here (no dakdoritang or dweji jjigae).